On arrival at Bagdogra Airport / New Jalpaiguri Railway Station, our representative will welcome and transfer you to Darjeeling (95kms/3hrs). 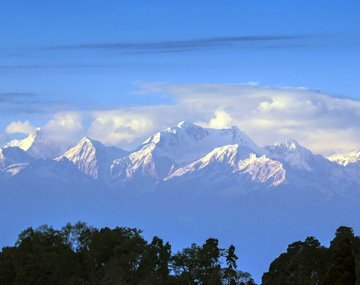 Also called the "Queen of Hill Stations”, Darjeeling invites travelers for some of the most exclusive experiences. From lively nature to beautiful hills, and lip smacking culinary delights to hospitable people, Darjeeling creates memories that linger for life. Tea gardens that surround it further add to its popularity. On arrival check into the hotel and relax. Later explore the town on your own. Return to your hotel. Overnight stay at the hotel. In the early morning set out for Tiger Hill from where you can see the spectacular sunrise. You can also see the morning rays falling on Mt. Kanchendzonga (World’s 3rd highest peak), Before returning to your hotel for breakfast, visit Ghoom Monastery and Batashia Loop War Memorial. Enjoy breakfast at the hotel and set out for a half day local sightseeing that covers Padmaja N. Zoological Garden (Closed on Thursday), Himalayan Mountaineering Institute (Closed on Thursday), and Tibetan Refugee Self-help Center (Closed on Sunday). You will also explore the Mall and Local Market (Closed on Thursday). The evening is free for shopping and other leisure activities on your own. Overnight stay at the hotel. In the morning set out for Gangtok (105kms/4hrs). Enjoying a stunning setting 5500ft above the sea level, Gangtok, the capital of Sikkim, is a tourist destination of repute and jumping off point for many a destination in the vicinity. Admired for its natural beauty and cleanliness, the town has impressive monasteries and hospitable people. The evening is free at your leisure. Overnight stay at the hotel. In the morning set out for a half day trip to Tsomgo Lake (12400ft), 32kms from Gangtok City. This oval lake is around 1Km long and 15 meters deep. The glacial lake is held in great reverence by the local people. Further drive 12Kms to reach Baba Harbhajan Singh Mandir built to commemorate a soldier Harbhajan Singh. The Evening is free for shopping and other leisure activities. 1. Indian Nationals visiting Sikkim must have a Photo ID Proof (Voter ID / Passport / Driving License – with address) in order to obtain Tsomgo Lake permit. 2. Travelers holding a Non-Indian Passport are not allowed to visit Baba Mandir. Your Gangtok and Darjeeling tour package concludes today. In the morning transfer to Bagdogra Airport / New Jalpaiguri Railway Station (115kms/ 5hrs) to board a flight/ train to your onward destination. Darjeeling brings in mind tea estates, sloping hills adorned with greenery and sights of Himalayan peaks. This magnificent hill station in east India, charms vacationers effortlessly. Infact vacationers make a beeline to explore this hill station where sparkling white magnolias, dawn-lit mountains and hospitable people combine together to welcome you. A short drive away is Gangtok, the capital of the Indian state of Sikkim that offers an uninterrupted view of Khangchendzonga besides a host of other attractions and activities. Vacationers prefer to explore these destinations on a single trip thus pushing the demand for Darjeeling and Gangtok tour packages. To meet the needs and expectation of travelers, we at BookOtrip offer exciting deals on Darjeeling tour packages. To keep it pocket-friendly, we have negotiated deals with major hotels, resorts, and other service providers. With a global approach and local expertise, we endeavor to provide travelers world-class experiences while not missing on any of the local interesting detail. Our itinerary covers the major highlight of the region that includes an excursion to Tsomgo Lake & Baba Mandi. You can book the package on your own or call our trip experts who will do it on your behalf to explore the interesting sights and sounds of this fascinating region in east India. Arrival & Departure transfers by exclusive, non-A/c Tata Sumo or similar vehicle except Gangtok city tour (Ex. NJP/IXB). I am a Tea lover and BookOtrip made it possible to get the natural fragrance of tea and the greenery was unforgettable!! !